A SHORT THREE-WEEK campaign has thrown up what many believe has been one of the most boring elections in recent memory. Yet Election 2016 was not without it’s moments and, of course, the most important part of it is still to come with tomorrow’s vote and a weekend of counting and results still ahead. For the over 550 candidates running in this election pavements have been pounded, doors have been knocked, posters erected, and leaflets dropped. On Saturday there’ll be fears, cheers and tears at count centres all across the country. The opening days of the campaign were dominated by a row over the so-called fiscal space. In a worrying throwback to the boom times, the parties were all arguing over money that didn’t exist. Put simply, the fiscal space is the amount of extra spending that might be available over the next five years if the economy continues to grow strongly. But it’s a bloody big ‘if’. Sinn Féin claimed it was the only party to get the numbers right and that Fine Gael, Labour and Fianna Fáil were all out by €2 billion in their estimation of the ‘money that we might have if things are still good’. It raised doubts about Fine Gael’s competence when it came to the economy – one of its core campaign messages. It also had a tetchy Michael Noonan snapping at reporters. But most of all it drove the general public nuts. Barring a remarkable turnaround at the ballot box it looks like it will be, at the very least, a good election for Fianna Fáil and a lot of that is down to the performance of leader Micheál Martin. He has been a consistently strong performer in the TV debates. He has well-argued his party’s message of fairness and people seem to be coming around to the idea that Fianna Fáil may have learned from the past, despite the other parties insisting otherwise. Martin has touted himself as an alternative taoiseach and his surging popularity over the course of the campaign (33% to 54%) has shown his past record has been no barrier to progress. All that said it won’t, on current polls, ensure the party can lead the next government but it’s certainly given the coalition more of a scare than it would have anticipated in this campaign. Fianna Fáil aren’t exactly back, but they’re certainly recovering and Martin has played an unlikely role in that. During last year’s UK general election a Channel 4 comedy series, Ballot Monkeys, imagined what really went on behind the scenes in political party strategising. One fictitious party handler described themselves as “political imagineer and purposeologist”. You got a sense during this campaign that there are a lot of these in Fine Gael. The party had an awful lot of handlers, the most money, the most research and what it thought was the best message going into the election. But ”keep the recovery going” fell flat, particularly when one poll showed the majority of people aren’t feeling any recovery. Instead of adding four or five points to its poll rating, as Fine Gael privately claimed it would, the party dropped five points in the opinion polls. There were reports last year that the Taoiseach would play a background role in this campaign and be shielded as much as possible from the media’s glare. Instead, Enda Kenny was front and centre for much of the campaign, but this didn’t turn out to be a good thing. He took 13 attempts to eventually rule Michael Lowry out of post-election deal-making. On day one of the campaign Kenny said he didn’t want to talk ‘economic jargon’ and exposed his own uncertainty when it comes to talking about in-depth economics. His debate performances were solid, but very unspectacular and far from the ‘exceeding expectations’ we were promised by some. He saved the biggest faux pas for the last weekend of the campaign when he hit out at the ‘All Ireland whingers’ in his constituency. The remark went down like a lead balloon. The Fine Gael leader doubled down on the comment for 48 hours, before apologising and insisting he was only talking about a small group of Fianna Fáil councillors. Few believed him. 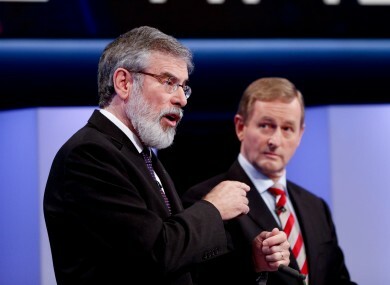 The McNulty misstep in Monday’s final debate also didn’t help. Kenny insisted today he’d had a good campaign – as you’d expect him to – but any objective analysis would say otherwise. Labour didn’t have as bad a campaign as Fine Gael but it was beset by various issues, not least the behaviour of its deputy leader Alan Kelly, whose ‘power is a drug’ comments raised eyebrows and questions about his style. Kelly was less prominent as the campaign wore on. That was probably a good thing. Labour failed to make any headway in the polls, one even put the party as low as 4%. Joan Burton’s first two debate performances were dreadful but she improved in her final outing. In someways that encapsulated the party’s campaign. It only got going when it might have been too late. Yesterday, Labour stressed the perils of a Fianna Fáil/Fine Gael government, a strong message that would resonate with many voters, but is it all academic at this stage? Labour is facing seat losses all over the country. What’s not clear is the extent of the damage and whether even Joan Burton can hang on. 6. Sinn Féin can run a great campaign – but can Gerry? Sinn Féin were by far the strongest party on social media and garnered a huge level of interest in its claims that RTÉ was ignoring it during the campaign. The party was excellent at tapping into voter anger over austerity and articulated a radical vision for Ireland in the coming years. It will not be the largest party in the next Dáil, but Sinn Féin will gain seats all over the country and the long-term project continues. But Gerry Adams’s involvement in that project will come under scrutiny after his poor performance in TV and radio appearances throughout the campaign. Several times, Adams seemed at a loss on the details of Sinn Féin’s manifesto and struggled in the TV debates when he came under pressure over his past. By contrast the likes of Mary Lou McDonald and Pearse Doherty were consistently strong in media performances and had an excellent grasp of the detail of Sinn Féin policies and how they would impact voters. The Social Democrats appear to have the edge on Renua when it comes to the battle of the new parties. Stephen Donnelly was the strongest performer in the TV debates and the party’s strategy of running a small number of candidates in key constituencies could yet pay off. The SocDems will probably return three TDs at a minimum but on a good day you can’t rule out five or six. That’s less likely for Renua which doesn’t appear to have caught on in the same way. The flat tax is an interesting idea but has been discredited elsewhere and hasn’t captured voters’ imaginations. The same can be said of its tough ‘three strikes’ policy on crime. Lucinda Creighton remains front-and-centre of everything the party does. In many ways that’s part of its problem, it’s hard to really understand what Renua stands for beyond furthering her own political ambitions. Similarly, the Anti-Austerity Alliance-People Before Profit grouping hasn’t capitalised on the supposed surge in support for a left-wing alternative and its message has been somewhat confused by some of its candidates urging transfers to Sinn Féin, and others not. But credit to the Green Party. They had some original campaign events, took RTÉ to the High Court and will probably return at least one TD. The comeback is slow but steady. 8. Are we headed for independents’ day? We were told that once the election was called all that support that independents and others have had for much of the last five years would slip away and yet the latest polls show it still in the high 20s. How that translates into seats at a local level is hard to call. But it is likely that the majority of the independents who graced the 31st Dáil will return to it after this weekend and there will be some newcomers. That said, the Independent Alliance hasn’t really taken off as the “radical but responsible” entity it was being touted as, and it’s unlikely it will play the role of kingmaker after the election. Email “9 things we learned from the general election campaign”. Feedback on “9 things we learned from the general election campaign”.